A very nice No.52V olive ripple fountain pen with gold plated trim; the pen has a very nice slightly flexible No.2 nib and writes nicely. There are no cracks, splits or serious scratches and the clip is secure. The cap band is 9ct gold. A very nice No.52½V red ripple fountain pen and pencil set with gold plated trim; the pen has a very nice flexible No.2 nib and writes nicely. The pencil is good with spare lead. There are no cracks, splits or serious scratches and both clips are secure. Here is a very nice 452 fountain pen in black with a Sterling Silver overlay; the pen has a rather nice flexible medium-to-broad grade 14ct gold No.2 nib; the nib has quite nice flexibility so writes rather nicely; they don't come much better than this. Here is a very nice 452 fountain pen in black with a Sterling Silver filgree overlay; the pen has a rather nice semi-flexible medium grade 14ct gold No.2 nib; the nib has quite nice flexibility so writes rather nicely; they don't come much better than this. A very nice Waterman's 92V in silver lizard finish with gold-plated bands and lever and a nickel-plated clip, made around 1935; it has a medium grade 14ct gold nib that writes nicely with just a little flexibility. A very nice Waterman's 32½ in green and black marbled finish with gold-filled trim, made around 1925; it has a medium grade 14ct gold nib that writes nicely. A very nice red ripple pencil with a 9ct gold band; the pencil has spare leads in the top; it does write nicely. A very nice Waterman's 94 in Moss Agate finish with gold-filled trim and a face clip, made around 1935; it has a fine grade 14ct gold No.4 nib that writes nicely. A very nice No.7 red ripple fountain pen and pencil set with gold plated trim; the pen has a green nib and a green cap band; the nib is a 'rigid' point 14ct gold and is 'tempered-to-armour-plated-hardness' suiting 'the salesman' to quote Waterman; it does write nicely but with no flexibility. The pencil is good with spare leads. A very nice No.7 red ripple pen with a pink nib and a pink cap band; the nib is a 'flexible fine' point 14ct gold and is 'as resilient as a watch spring' suiting 'stenographers' to quote Waterman; it does write nicely with lots of flexibility. A very nice No.7 red ripple pen with a yellow nib and a yellow cap band; the nib is a 'rounded' point 14ct gold and 'makes heavy characteristic lines without pressure' suiting 'the left-handed writer' to quote Waterman; it does write nicely and has good flexibility. A very nice No.7 red ripple pen with a grey nib and a grey cap band; the nib is an 'oblique' rigid point 14ct gold and is 'preferred those who hold the pen at an angle' to quote Waterman; it does write nicely but with no flexibility. Here is a very nice 52 fountain pen and pencil set in red ripple with gold plated trim and in what could be the original box too; the pen has a rather nice semi-flexible medium grade 14ct gold No.2 nib; the nib has quite nice flexibility so writes rather nicely; they don't come much better than this; the box has had some damage but been satisfactorily repaired. Here is a very nice 452 fountain pen and pencil set in black with a Sterling Silver filgree overlay; the pen has a rather nice semi-flexible medium grade 14ct gold No.2 nib; the nib has quite nice flexibility so writes rather nicely; they don't come much better than this; the set is boxed too but the box has had some damage. A very nice Waterman's Ink-View in emerald green striated with gold-filled trim, made around 1938; it has a medium grade 14ct gold keyhole nib and writes nicely. Here is a very nice undamaged but slightly worn Waterman 624 black hard rubber and 'mother of pearl' fountain pen with a fine grade 14ct gold No.2 nib; the nib has a little flexibility and writes rather nicely. This pen is very difficult to find. Here is a very nice, VERY RARE, 475 fountain pen in black with a Sterling Silver overlay; this pen is an eye dropper and not a lever-filler and these eye droppers are very hard to find; the pen has a rather nice slightly flexible medium grade 14ct gold No.5 nib; the pen writes rather nicely; they don't come much better than this. A very nice mechanically sound jade patrician with a beautiful slightly-flexible medium grade 14ct gold Patrician nib; this one has darkened a little in places but it looks better in the hand than it appears in the picture. A Gentleman fountain pen from around 1985 in an gold-leaf laque finish with gold-plated trim; the pen uses cartridges or a converter and there is a converter fitted; it has been used but very little and is still in lovely condition; the pen has a medium grade 18ct gold nib and writes nicely. A very nice Waterman's 94 in Persian finish with gold-filled trim and a rivet clip, made around 1935; it has a fine grade 14ct gold No.4 nib that writes nicely. A very nice Waterman's Ink-View in golden brown striated with gold-filled trim and a 'dagger' clip, made around 1938; it has a medium grade 14ct gold keyhole nib and writes nicely. Here is a very nice 452½ fountain pen in black with a Sterling Silver overlay; the pen has a rather nice slightly flexible broad grade 14ct gold No.2 nib; the nib has some flexibility so writes rather nicely; they don't come much better than this. An Exclusive fountain pen from around 1989 in brown and black marble with gold-plated trim; the pen has been used but still is in lovely condition with a medium grade 18ct gold nib. Here is a VERY RARE undamaged 78 in black hard rubber with a massive No.8 nib; it has not been serviced as this is definitely a collectors piece. A very nice No.7 red ripple pen with a green nib and a green cap band; the nib is a 'rigid' point 14ct gold and is 'tempered-to-armour-plated-hardness' suiting 'the salesman' to quote Waterman; it does write nicely but with no flexibility. A very nice No.7 red ripple pen with a purple nib and a purple cap band; the nib is a fine point 14ct gold and is 'stiff' suiting 'accountants' to quote Waterman; it does write nicely but with no flexibility. A very nice mechanically sound onyx patrician with a beautiful quite-flexible medium grade 14ct gold Canadian Patrician nib; this one has darkened a little but it looks better than it appears in the picture; it is unusual to find a Patrician with a flexible nib. A very nice 'Hundred Year' fountain pen in blue ribbed finish from 1940 ish; the pen has a fine grade 14ct gold nib that writes nicely with some flexibility. A very nice 412 Sterling Silver filigree over black hard rubber lever-filler in lovely condition; this is the clipless type with a medium grade 14ct gold No.2 nib; writes beautifully too with some flexibility. A very nice 12½ Sterling Silver line and dot over black hard rubber lever-filler in beautiful condition; this is the clipless type with a fine 14ct gold No.2 nib; writes beautifully too. Here is a very nice undamaged but slightly worn Waterman 25 black hard rubber fountain pen with a fine grade 14ct gold No.5 nib; the nib has a little flexibility and writes rather nicely. This pen, particularly with the No.5 nib, is very difficult to find. A Harmonie fountain pen from around 1999 in red and black finish with gold-plated trim; the pen has a medium grade nib and has been used but not a lot and thus is still in lovely condition; boxed too and collectable as not too many were produced. An Exclusive set from around 1989 in black with gold-plated trim; comprises fountain pen and ballpen; they have been used but still in lovely condition and boxed too; the pen has a fine grade 18ct gold nib. An Executive fountain pen from around 1995 in an amber laque finish with gold-plated trim; the pen has a fine grade 18ct gold nib and has been used but not a lot and thus is still in lovely condition. 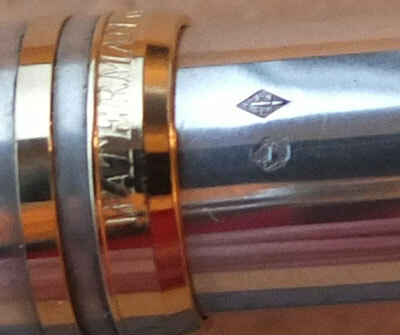 A very rare Waterman Combination fountain pen and pencil in Hallmarked Silver and marketted by Mappin & Webb; the pen was hallmarked in London in 1933/34 and is in quite good condition; very few of these Combos have been found. A very nice Canadian Waterman's 92 fountain pen and pencil set in green and bronze with gold-filled trim and rivetted-type clips, made around 1932; the pen has a fine grade 14ct gold nib and writes nicely with some flexibility. A Gentleman set from around 1985 in an amber laque finish with gold-plated trim; comprises fountain pen, rollerball and pencil; they have been used but still in lovely condition and boxed too; the pen has a broad nib. Here is a very nice 452 fountain pen in black with a Sterling Silver overlay; the pen has a rather nice semi-flexible medium grade 14ct gold No.2 nib; the nib has just a little flexibility so writes rather nicely; they don't come much better than this. Here is a very nice undamaged but worn Waterman 15 black hard rubber fountain pen with a fine grade 14ct gold No.5 nib; the nib has only a little flexibility but still writes rather nicely. This pen with the 5 nib is very difficult to find. A very nice 552½ 9ct-gold line and dot over black hard rubber lever-filler in lovely condition; this is the clipless type with a broad-oblique softish No.2 nib; writes beautifully too. A very nice Waterman's 94 in mahogany with gold-filled trim and a crimped clip rather than the rivet clip, made around 1935. A very nice Waterman's 94 in moss agate with gold-filled trim and a crimped clip rather than the rivet clip, made around 1935. Here is a very nice 58 red ripple with a Manifold No.8 nib; it is alongside an Onoto Magna for sizing purposes; the Magna is for sale separately.